Amex Membership Rewards points are one of the most valuable point currencies out there. Along with Chase Ultimate Rewards and Citi ThankYou points, they offer an incredible degree of flexibility. You can redeem them for a host of different things and can use them at Amazon.com, Walmart.com, Expedia or even in a NYC Taxi. However, some of the best value you can get from your points is when transferring them over to airlines or hotels. Unlike Chase, American Express does not allow the option of converting cashback earned from some of its cards to Amex Membership Rewards points. With American Express you can either earn points or cash back. Of all the flexible credit card point currencies, Amex transfer partners are among the most extensives. 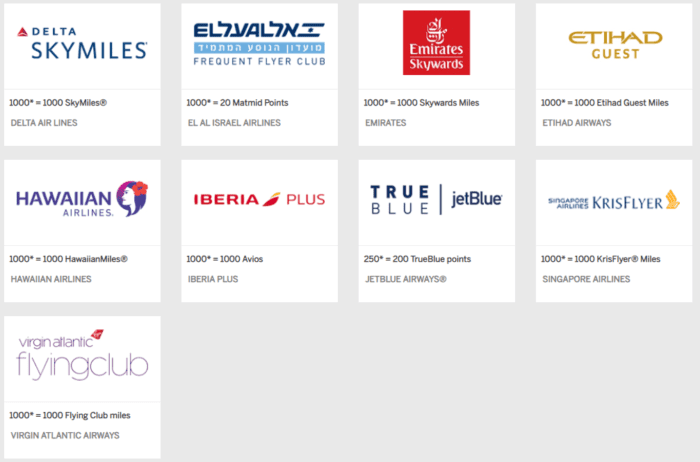 You can transfer US Amex Membership Rewards to 17 Airline Frequent Flyer programs. Although the ratio and the minimum number of points needed vary between airlines, the majority transfer at a ratio of 1:1, with a minimum transfer of 1,000 points. The time it takes a transfer to take place varies by airline. Typically points will transfer to most carriers instantaneously, although in practice you need to allow one or two days for the transfer to be completed. Some airlines like Aeromexico can take up to 14 days. American Express transfers work with three hotel transfer partners. You can transfer Membership Rewards to Choice Hotels, Hilton Honors, and SPG/Marriott/Ritz Carlton. Typically transfers happen almost instantaneously, although some delay is not uncommon. One thing to keep in mind is that even though you can transfer your points to hotels, it does not necessarily mean it is a good idea. 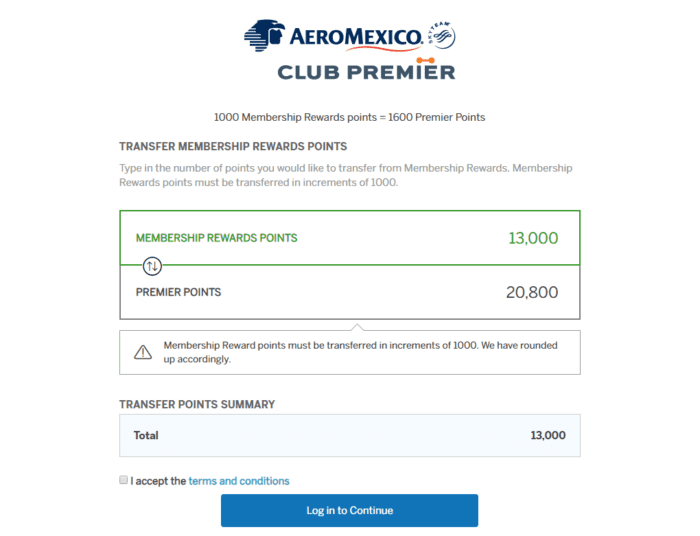 When you consider the transfer ratio and the other options you have for using your points, it becomes evident that transferring Amex Membership Rewards points to hotels is poor value. If you need a few thousand points to hit an aspirational redemption, then a transfer can make sense. If you are looking to transfer a substantial number of points, you will get much better value from airline Amex transfer partners. The best strategy is to maintain the flexibility of your points and keep them until such time as you have a specific redemption in mind. Your priority should almost always be holding cash, then flexible points, then program specific points. The process of American Express transfer is relatively easy. First, you will be asked to link your airline or hotel accounts to American Express. Once you have done that transfers are simple. 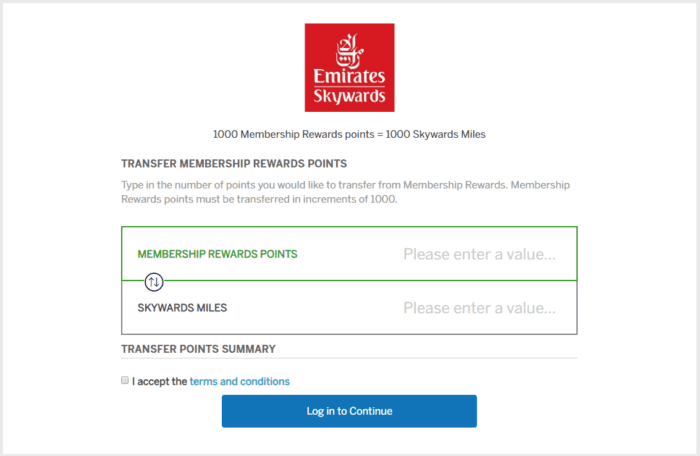 To initiate a transfer head over to the Membership Rewards travel partner page and click on the program you want to transfer points to. You will then be prompted to enter either the number of Amex points you want to transfer or the number of miles/points you would like to receive in your loyalty account. The ability to enter the number of miles you would like to receive is handy when you want just enough points for a specific redemption, and the transfer ratio is different than a simple 1:1. Without a shadow of a doubt, Amex Membership Rewards points are some of the most valuable on the market. However, this does not mean you have to collect them exclusively. Ask any miles and points aficionado what their strategy is, and they will tell it is about maximizing their points earning from every dollar spent and maximizing the redemption value of every point. To that end, they will collect a variety of different points and have different cards. They will have no loyalty to one program, but instead will use the best card with the highest yield to make every individual purchase. 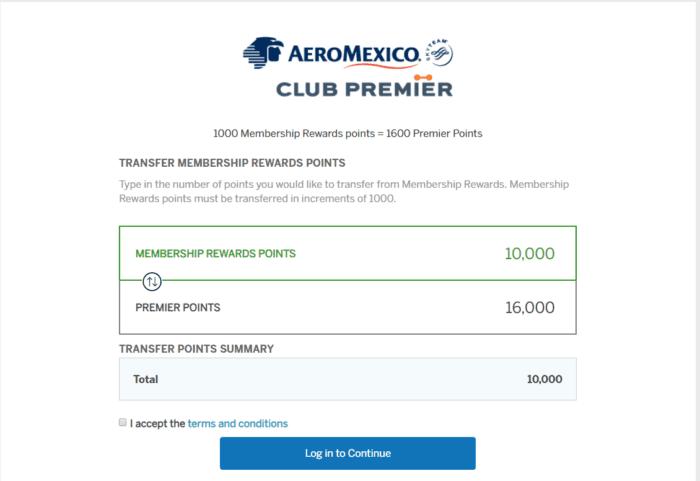 So while Amex Membership Rewards points are great, they should be part of your overall travel rewards strategy based on your own travel goals and needs.